The name Flea Market was coined in France from "Marche aux Puces" which means "market of fleas" because the old furniture and clothes for sale were sometimes infested with fleas. But the concept of a central area where all manner of tradespeople could sell items goes back further in history. In the current economy flea markets have become much more popular for people and antique collectors looking to save money and find bargains. On a nice day you can find some flea markets that are packed full of people just like or even more than at a retail mall. 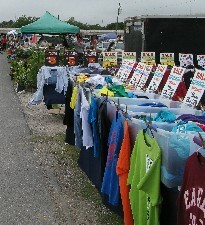 Popular flea markets have become a destination for tourists from out of town and also for local residents who need something to do on the weekends. The americanfleas.com flea markets listing is free and is continually updated with new listings. There is a Bookstore with ebooks related to Flea Markets and Crafts. Some markets come and go without telling anybody. Some markets are new and have not been checked or verified. So call their phone number if you plan to drive there.